Sideswipe – notoriously the first Autobot car to get the modern Masterpiece treatment, I remember having mixed feelings when I first saw this thing’s dinky size. I wasn’t really totally sold on it at first – it was tiny in comparison to the infamous MP-01 (the definition of Masterpiece for me back then) and sported absolutely no die-cast metal. Add in the $80+ price tag this ruby jewel sported and I was almost sure that the Masterpiece designation had become nothing more than a brand label to sell lower-quality figures from the line. Thankfully, I was proven wrong. Sideswipe in stylish disguise as a 1984 Lamborghini Countach LP5000 S. That may or may not be its exact model number, but I’m pretty sure it’s close. I’m not exactly an automobile/supercar connoisseur though. The rear assembly (note spoiler) is the area with the most paneling and bits and pieces jutting up a slight to reveal this figure’s true identity as an Autobot warrior. Thankfully the only real area with kibble is in the rear, those black bits underneath the exhaust pipes. I seriously have to hand it to Takara for their engineering here – it’ll become more impressive with how well Sideswipe compresses into his vehicle form after the transformation is shown off. Licensing is of course a thing, in that we get a tiny and very detailed Lamborghini badge on the front hood, below the much more prominent Autobot insignia. The decals on the rear taillight bar are also a really nice touch, reading “Lamborghini” and “Countach“. The side panels are a bit irksome in how they aren’t totally flush, but what can you do. The paint finishing is done excellently as well; I can spot a few minor areas where the difference between red plastic and red paint is apparent, but the painted pieces are smooth and even in consistency. I’ve actually heard that Sideswipe is known for some quality issues with his paint apps, though thankfully such an ill fate hadn’t befallen me. Juxtaposed with my ‘ol 1:24 Revell Lamborghini Countach custom that I made deliberately in Masterpiece Sideswipe’s image. They aren’t exactly the same size, unfortunately. The model kit is in 1:24 scale, meaning the entire Masterpiece line is somewhere a little below that. I didn’t realize until the Masterpiece had arrived in my hands that Sideswipe actually has that funky trapezoid on his roof; had I known I would’ve painted as much on the Revell model. There was also the issue with the tinted windows that couldn’t exactly be achieved on the kit for its own reasons. Weaponized with a giant white cannon on the roof, not an odd image in the least. But hey if you wanna be just a little more conspicuous on the streets and send everyone running for a bomb shelter, we can tack on a rifle to your cannon too. Sideswipe in all his bipedal glory. 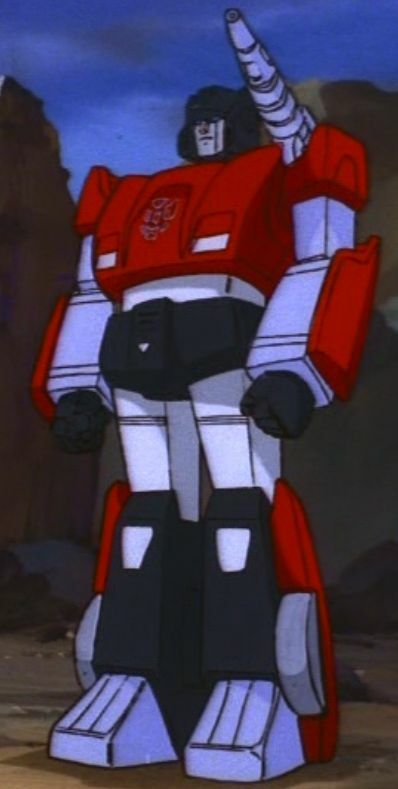 A friend of mine actually brought this up when he was referencing Sideswipe’s robot mode to my Countach model – he thought I did the vehicle mode inaccurately because there was no white on the car, despite a sizable portion of Sideswipe’s ‘bot mode being made up of the color. Reality is, the white bits are all just hidden really well inside the Countach mode; hats off to Takara Tomy for hiding an entire palette so well. Sideswipe is certainly a bit top-heavy – not in the traditional sense, but rather just that his Lamborghini hood is just extraordinarily wide on him. Coupled with his relatively smaller head, he almost looks radically disproportionate from some angles. I do generally love the robot mode though – it’s an outstanding representation of his classic character model updated with just enough modern detail and realism. Sideswipe’s accessory/weapons layout. It’s a bit more than the standard, given we get some bonus piledrivers in addition to the standard sidearm and mounted weaponry. Standard beam rifle flare gun isn’t anything special, though it is pretty well detailed. All silver, no lining and pegs into the hand for a more secure grip. And then we have the shoulder-mounted missile launcher which was originally just a giant hunk of white plastic. Unlike the gun, I just had to detail this one up – there was so much that went wasted and lost in the mold because it wasn’t lined. I also painted in the barrel black for some depth. The thing can tilt up and down just a slight, though unfortunately it can’t rotate. Makes for shots from the left side kinda difficult, since the chunky thing covers up Sideswipe’s head. As I mentioned above with the vehicle form, the cannon and the rifle can be combined for a bit of extra unified firepower, but it’s rather impractical to use this configuration anywhere else except on the hood of the Countach. And then Sideswipe’s piledrivers, apparently enough of a trademark for the character to make it into the Masterpiece figure. They’re nothing special, just two plain black hunks of plastic that clip into the wrist sockets when the hands are folded back into the forearms. No spring-loaded action, but I can understand cost-cutting measures getting in the way. And this would be the display I was going for when I picked up and gave a hand at my Revell 1:24 Countach. It doesn’t look half bad, no? I mean yeah they’re out of scale but it’s pretty close and not overtly noticeable at first glance. We can pass it off as the work of that crazy mass-displacement/size changing technology Soundwave and Megatron use, yes? And of course, next to his fellow Autobot car, MP-17 Prowl. As of this writing I actually also already own Wheeljack, but he’ll come in for the family shot later. I’m really liking the varied biped styles these two use, with Prowl sporting the more classic front-facing car chest and Sideswipe’s hood being laid down flat. Sideswipe’s a bit of a pioneer figure, given he was the first smaller-scale Transformer to be released in the new MP-10 scale. I know I wasn’t the only one to have doubts about his size versus asking price, but after owning this figure I can say he’s worth every shiny penny. I’m still willing to bet most of the dough comes out of owning a Transformer figure with official Lamborghini licensing, but knowing that the figure’s deliberately kept to utmost detail with the real-life car is a comforting fact; I wouldn’t expect anything less from this line now.